This shop has been compensated by Collective Bias, Inc. and its advertiser. All opinions are mine alone. #samsungtargettech #CollectiveBias Parties are totally my thing, but I remember a time when they used to give me MAJOR anxiety and stress. There was always so much to do, so much to remember and too many places I had taken notes, I was a disorganized hot mess. This past weekend, I was able to throw my daughter Jade’s fifth birthday party, and it was one of the easiest family parties I’ve hosted yet. Thank you, Samsung Galaxy Note8 for keeping me organized and high-tech. And with my next ladies dance party theme being “unicorns”, I thought I’d double down by having her party theme match (besides, I could reuse some of the unicorn decor for the dance party #winning). 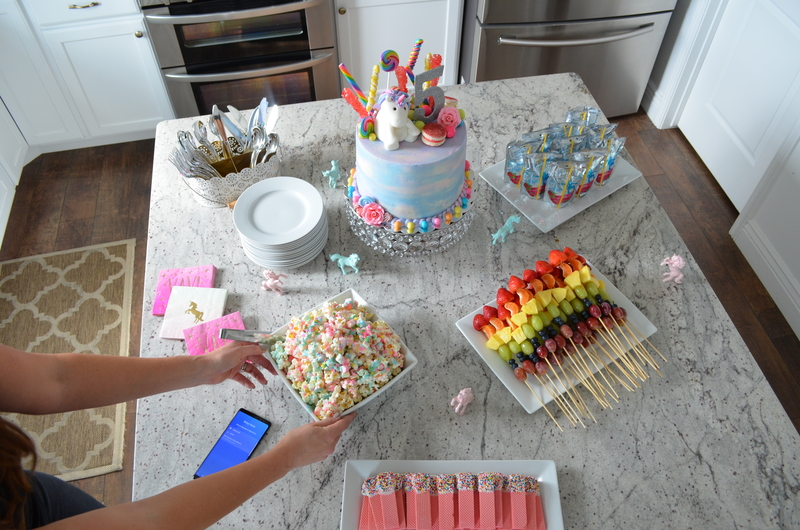 Let me share all of the party details to share my best practices for this Unicorn inspired bash. By using sporting equipment like cones (I sprayed the cones with spray paint), baseballs, flying disks, kick balls, rainbow-colored buckets, a pink baseball bat and hula hoops we were able to create the relay races, which were a HUGE hit. Events included weaving through the pastel color cones, jumping through the hula hoops, then tossing baseballs and disks over the larger cone and into the buckets. Was a fun way to keep the kids entertained and burn up some of the sugar energy by having them run around and go through the different obstacles. You can also switch up the course as many times as you want to keep it fresh and exciting. At the end of the party I think we all enjoyed ourselfs and the birthday girl had a great time! Which is what matters the very most! ⟵Unicorn Magic Dance Party – Tickets Are LIVE!! !